Nice coverage of all issues involved in designing a landing page. A very useful pack of design elements and worksheets is included. Could have used more layout lessons, though. Given the price and time involved (took me about 6 hours not counting the assignments), it is a pretty good deal. I just finished watching the last video in the DesignBoost Landing Page Design Course. As you might have guessed from the name, it covers how to build good landing pages (i.e. : that convert well for the audience they are intended for). I took the course because I'm really not satisfied with my current landing pages (or my regular website), and it seemed like it would help. The course consists of 24 lessons. Each lesson has one or more videos (mostly streamed online via Vimeo), and there are several PDF worksheets to guide your design work. There is also a large download pack with buttons, background and whole page designs that is quite useful. During the course there are also links to useful resources and articles. The course starts with defining landing pages and how to use them, including the importance of keeping them focused. It is much easier to convert a specific audience rather than try to make a single page for everyone that converts poorly for all of them. In that sense, all landing pages should have a single strategic goal and an audience in your mind. If you have several goals or audiences (search traffic, PPC, e-mail campaigns, Facebook,etc) , you should design one for each. To that purpose, several of the lessons involve how match the traffic to the page, defining the sales funnel and conversion goals. 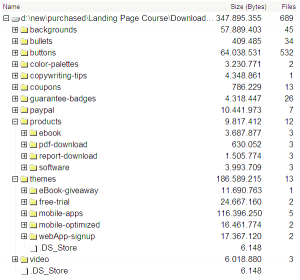 Files in the download pack. Next the course goes to the page copy, covering headlines, hooks and several tricks to improve conversion (such as using client or download numbers as social boast, testimonials, establishing trust and setting a sense of urgency). Then it covers layout, design, color and how to use the helper tools and design elements in the download kit that comes with the course. At this point, if you are following the lessons and assignments with the worksheets you should have a finished landing page design. 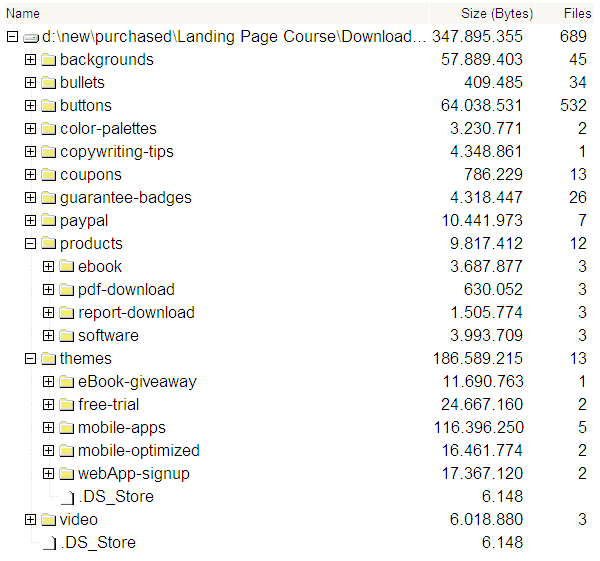 The final lessons cover slicing (cutting the page graphical elements to convert to HTML), usability and split testing (for split testing, I have used and recommend Optimizely – see my review for more details). Overall, the course is well thought and includes a process using worksheets so that for any landing page you need to design, you can just answer the questions and cover the guidelines in the worksheets to follow along. I personally felt that it could have had more coverage of layout options. The download pack is very useful. Given the price and time involved (took me 6 hours not counting the assignments), it is a pretty good deal. I'll definitely go through my old landing pages now with new eyes. Nice coverage of all issues involved in designing a landing page. A very useful pack of design elements and worksheets is included. Could have used more layout lessons, though. Given the price and time involved (took me about 6 hours not counting the assignments), it is a pretty good deal.